We face many obstacles in life. Some of them deal with our physical reality such as illness, injury, competing against others and personal achievement. Other obstacles challenge our minds and emotions like academics and relationships. But what about spiritual obstacles? 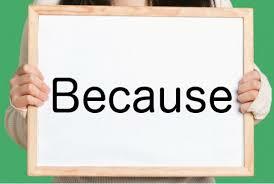 Enter the word “because.” It fascinates me when I think about it in a spiritual sense. Because seems like a harmless enough word. I probably started using it when I was three years old (I’ll have to check with Mom on that one). Used in a spiritual context, it appears to have a dual meaning. On one hand, people believe, because? When pressed, folks in this camp are not really sure why they believe what they do. Perhaps belief stems from family tradition or a creed or simply just “because.” On the other hand, there are those who believe, because! These folks are speaking from personal experience. There is a certainty or conviction that supports their belief. This dual portrayal of the word begs a question, “which camp do you find yourself in?” Perhaps a story would explain my point more clearly. I imagine Because to be like a mighty river snaking through the landscape of our lives. And just like every other river it has two shores. One shore is swampy, continually subjected to flooding and lacks firm ground. This shore is canvased by travelers who are content with being told how to be religious. The opposite shore stands high and dry and is established on firm ground. I imagine its edge to be lined with boulders, making it impervious to erosion by the river. On this shore are those who have a certainty about their faith, which comes from a personal experience. Once upon a time I wandered the swampy shoreline, plodding through the muck and mire. I tried hard to elevate my standing by being very religious. As time passed, I congregated with others who shared my view. Trying to be good should count for something, and we believed it would eventually get us to the other side of the river. Surely there’s strength in numbers. How could so many people be wrong? The people on the other side of the river are no better than us. Together we planned to build a bridge across the river. We thought we deserved to be on the other shore. The soggy, spongy ground was not able to support a foundation for the bridge, however. I found myself becoming restless. I decided to search closer to the shoreline of the river Because for another means to cross it. I happened to discover a derelict one-person craft. People on the opposite shore saw I had located the craft and began to shout, “get in the vessel.” They called the vessel “Faith.” These people claimed I could use the boat for free because its owner had paid for my passage. I hesitated by the river’s edge. The appearance of the water rushing past was intimidating. It’s current was frighteningly strong. I spotted whirlpools and rapids that I would have to engage if I attempted to cross. The boulders lying just beneath the surface of the raging water would certainly destroy the vessel Faith. I eyed the boat once more and noticed its interior contained only a simple wooden poll. This looked more and more like a suicide mission. There’s no way I could make it across on my own. Overcome with sadness, I began to back away. As I did, my eyes caught the movement of people on the other shore once again. Hey, wait a minute. Is this how they made it across? Those people, the subjects of my gaze, were shouting more words of encouragement. I strained my ears to listen, “come experience what we’ve experienced,” they cried. I thought about what they said. I was tired of trudging around in the muck with nothing but uncertainty to look forward to. The people shouting from across the river had something I didn’t have and I found myself wanting it. I turned back to the river and launched the vessel called Faith and jumped in. There was no turning back, I was committed. To my surprise, the moment I laid my hands on the wooden poll I was immediately transported to the other shore. Today, I stand on the rock solid shore of certainty. It is a blessed and humble feeling to be here. I have discovered a special kinship with travelers on this side of the river. The belief we share is based on a personal experience, of being carried across the river in Faith. Having once been on the other shore myself, I will not judge those who have not come. Instead will I call out to them, “Come, experience what I’ve experienced.” Take the journey in the vessel of Faith across the river of Because. This entry was posted in A word, Devotional, Writing and tagged because, believe, certainty, Christian, faith, personal experience, river, spiritual on September 26, 2015 by roushwm.